1.MARK OF THE CONNECTOR. The N is neutral wire, L is live wire. 2.PRACTICAL DESIGN: Both ends of the terminal have a design that can be connected to each other. Each group has 2 holes, their interiors are connected. The terminals are not divided into the in and out directions. 3.INSULATING MATERIAL. Using insulation flame retardant material and stainless steel circlip structure, avoiding wires fall off , arcing, dustproof and moisture-proof. 4.NO TOOLS REQUIRED. Simple operation, saving time and effort. Hold down the item and press the terminal, and then put the peeled wires into the terminal, finally loose hands and finish the connection. 5.MULTIPURPOSE. 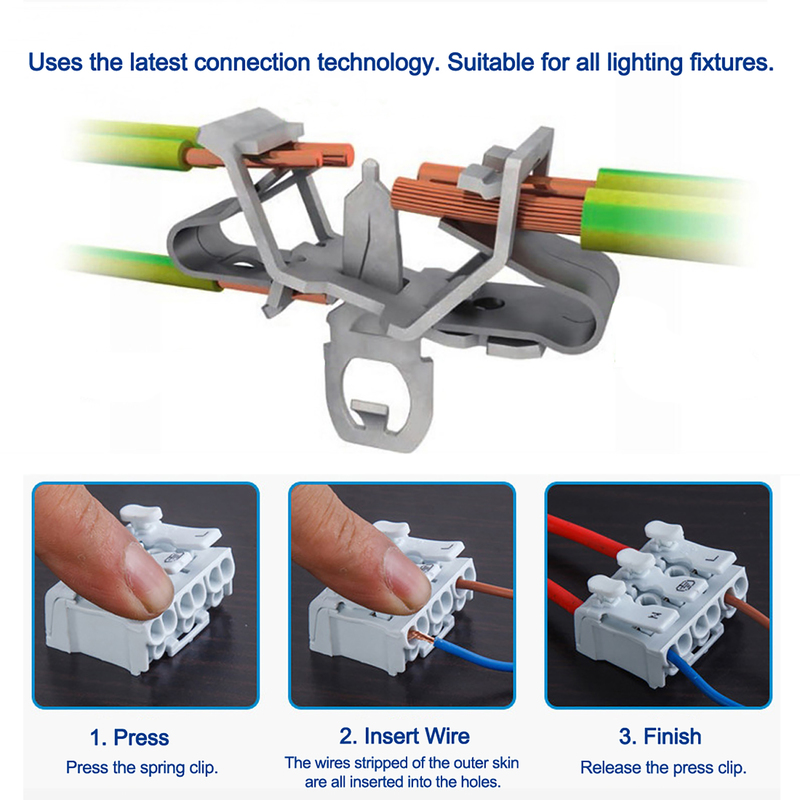 Widely used in lighting, power and automotive wiring, motor, electrical control, household appliances,machinery and wire joints. 6.NOTICE: Please use it in the rated range. Do not connect high power electrical. 1. Press the spring clip. 2. Insert wires (The wires stripped of the outer skin are all inserted into the holes. Can't be exposed). 3. Release the press clip.